“On behalf of Continental, we would like to congratulate Anderson Process on retaining your STAR status. As part of the Continental Authorized Distributor program, the STAR designation offers unrivaled distinction in your local trading area as well as in the national marketplace. With the Underwriters Laboratories, LLC. (UL) verification of your facilities and competencies, enhanced opportunities await your sales efforts. By achieving the STAR standing, your company has also demonstrated the sales and technical expertise necessary to fulfill the exacting requirements of fabricating high-integrity hose assemblies. Your STAR status also indicates your aptitude for providing vital value-added services for today’s demanding end-users. 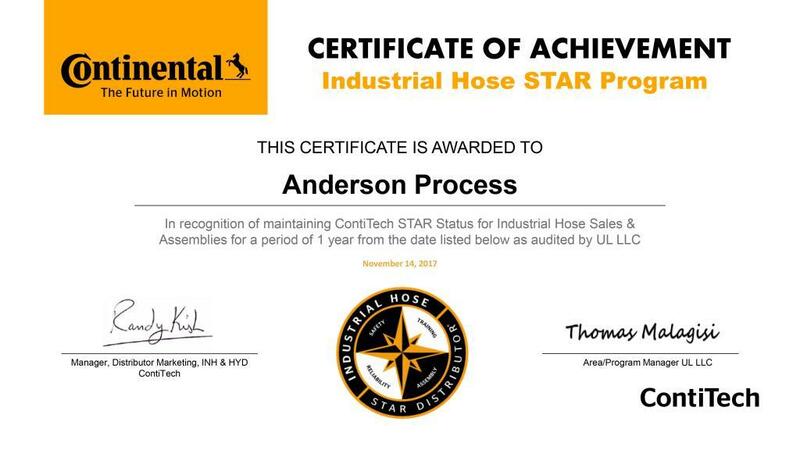 Anderson Process will enjoy the benefits of ContiTech’s high profile North American advertising campaign, STAR designation on the ContiTech website, free use of HoseTrakker 2.0 Online, regularly introduced crimp specifications, and the competitive advantage of being an elite ContiTech Authorized Distributor.